Eidsvold, Queensland. Founded as a sheep station in 1848 by Scottish-Norwegian brothers Charles and Thomas Archer. Named after the village in Norway where the Norwegian constitution was adopted in 1814. 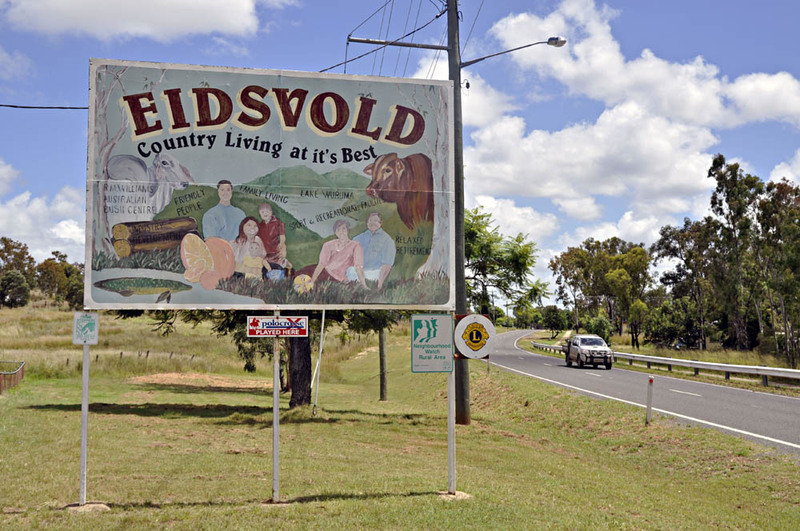 Today Eidsvold, Qld, is a small village in the Burnett region, approximately five hours drive north-west of Brisbane. One of my greatest interests is Norwegian Australian history, i.e the history of Norwegians in Australia. Or Norwegians ‘Down Under’, if you wish. In September 2014 I published a book about Norwegians in Australia. It is titled Nedenunder og hjem: Nordmenn i Australia gjennom 400 år which translates to something like «Down Under and Back Again: Norwegians in Australia throughout 400 years». The book is written in Norwegian and is available for sale both in bookstores in Norway and online. You can also buy it from me. Unfortunately, there are no plans yet for an English translation, but that is obvisously something I would like to see happen. I know many Australians too would be keen to learn more about this chapter of their own history. An introduction (in English) to some of the more notable Norwegians in the country is given in the article Norwegian Builders of Australia. However, these men (unfortunately, few women of Norse birth has managed to gain prominent positions) are but a few sucessful examples among the several thousand Norwegians who have left Norway in order to try their luck on the other side of the globe. In 2012 I submitted a master thesis in history at the University of Oslo titled A Norwegian Waltz: Norwegian Immigration and Settlement in Queensland 1870-1914. (Download thesis here). This is a study of the Norwegian settlement in one part of Australia: Queensland. During the time period in question, close to 2000 Norwegians arrived here. Most of them were immigrants who travelled on relatively cheap passages, subsidised by the Queensland government, who wanted to attract European settlers. In additon, a good number of Norwegian seamen also found their way to these coasts; many of them jumped ship to try their luck onshore. Today, approximately 3700 Norwegian-born persons live ‘Down Under’. One reckons that close to 25,000 people in Australia descend from Norwegians (census 2011). Behind these numbers, many fascinating stories of success and failure are hidden. If you have comments or wish to purchase the book please feel free to contact me. You can use the following e-mail address: fredrik.larsen.lund (at) gmail.com. Hei Ron! Sorry, I haven’t looked into that so I’m afraid I can’t answer your question. My concern has been Norwegians in Australia. Kind Regards, Fredrik. Jeg ble så begeistret i dag da jeg fant ut at du har skrevet en bok om nordmenn som emigrerte til Australia. For et års tid tilbake fant jeg med en tilfeldighet ut at jeg hadde slektninger i Australia. I min leten etter informasjon om min tippoldermor, kom jeg over korrespondanse mellom personer fra Australia som også søkte etter samme person. Slik fant jeg ut at min oldermors bror reiste til sjøs tidlig og tydeligvis endte opp i New south Wales i Australia. Jeg hadde i sommer besøk av en av hans barnebarn og vi er på begge sider svært begeistret over å ha funnet hverandre. Vi snakket mye om hvordan det måtte ha vært for ham å reise så langt hjemmefra uten noen gang å vende tilbake til Norge. Nå gleder jeg meg veldig til å lese om hvordan livet fortonet seg for dem som emigrerte. Takk for hyggelige ord! Jeg håper og tror boken vil gi deg mer innsikt i hvordan det var å utvandre til Australia. Hilsen Fredrik. You write «unfortunately, few women of Norse birth has managed to gain prominent positions». I appreciate that your study has mainly focussed on Queensland, but Hilda Samsing was a Norwegian woman who probably did more than anyone else to promote the growth of skiing in the state of Victoria from an obscure hobby to a major sport from around 1919 to 1926. Earlier she was a senior nurse in World War 1 and her war diaries are important references for historians. Other Norwegians who were major figures in early Victorian skiing include Martin Romuld (the best ski jumper in the state in the 1930’s), Trygve Olsen and the legendary Eric Gravbrott Johnson, who is still remembered today. More recently Tor Holth published ‘Cattlemen of the High Country’ in 1980 which is still the best researched book on Victorian mountain grazing.